WILSHIRE Council has announced its intention to apply for planning permission for another extension to Melksham cemetery. The proposed extention is in addition to the one granted planning permission in 2015, which will provide burial space for the Muslim community and the wider public for the next 10 years. If approved, the new extension will provide another 10 years of potential burial space – ensuring the land can service the community for the next 20 years. The news has come in response to questions posed by cllr Jon Hubbard after queries were raised at November’s Melksham Area Board meeting, asking when the extension to Melksham cemetery, approved in 2015, will be completed. Now, the response from Wiltshire Council says, “The extension at Melksham cemetery was granted planning permission in 2015 and work commenced in 2016. In the interim, additional land has been made available for a further extension to Melksham cemetery. This additional land would require its own change of use planning application. To expedite the use of the first extension, the council will clear the site and replace the heras fencing with post and rail. This will allow the first extension to be used by the Muslim community and the wider public, whist the new planning application is submitted. The first cemetery extension will be available for use in the new year. “The 2015 planning permission has been partially implemented, so will not expire whilst the additional planning approval is sought. “The cemetery boundary wall, which has been partly demolished, is of no historical significance; however it does run along the boundary of the conservation area. The new boundary wall will be located in the conservation area and must be constructed of a different material to the existing blocks. The council submitted a second discharge of condition application to allow the wall to be constructed in a faced stone, rather than the heritage bath stone initially approved. This will make a major saving to the project. 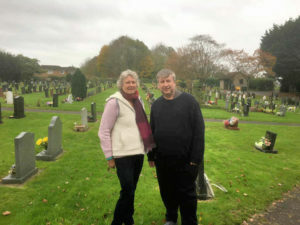 Above: Cllr Jon Hubbard with Melksham’s mayor, cllr Adrienne Westbrook, at Melksham cemetery.